The Japanese newspaper Asahi Shimbun, citing sources in the US administration, has reported that the next summit between the United States and DPRK was to take place as early as the middle of November. Possible venues for this meeting were Stockholm and Geneva. However, the cancellation (or more officially an indefinite postponement due to conflicting work schedules) of the November meeting between the U.S. Secretary of State Mike Pompeo and his counterpart Kim Yong-chol has caused the summit to be de facto rescheduled for a later date (yet to be announced). This is a sign of another pause in the dialogue between DPRK and the USA, and hence, an opportune time to draw conclusions about the relationship between the two countries in the preceding period, and to attempt to surmise when the next summit might be. It is worth reminding the readers that in July, the American news and information website Axios reported that the second North Korea—United States summit might be held in New York, in September. However, representatives of the US administration took a different view, believing that DPRK needed to demonstrate progress made in the process of denuclearization before the second meeting between the leaders of the two nations could take place. On September 11, Donald Trump received a letter from Kim Jong-un suggesting staging another summit. The White House Press Secretary Sarah Sanders made a statement about this, highlighting that it was a “very warm, very positive letter”. And on 21 September, during an interview with Fox News and MSNBC, the U.S. Secretary of State Mike Pompeo expressed hope that the second summit between DPRK and the USA would take place very soon, noting that the only task remaining was “to make sure conditions are right”. “Much more work needs to be done, but the United States has the patience and determination,” he said. Before Trump’s address at the General Debate of the 73rd session of the UN General Assembly in New York, he had reiterated that preparations for his next meeting with the DPRK leader, Kim Jong-un, were ongoing, and for the time being, much progress had been made to ensure denuclearization of the Korean Peninsula. In his other speeches, Trump expressed confidence in his belief that Kim Jong-un would like to ensure peace and prosperity in his nation. And while speaking in front of his supporters at a rally in West Virginia, Donald Trump even joked that he and the DPRK leader “fell in love” after their meeting in Singapore. On 7 October, the U.S. Secretary of State Mike Pompeo visited Pyongyang. Although the details of the three-hour meeting have not been publicized, DPRK reports about the visit were neutral and friendly in nature. And according to South Korean media outlets, Mike Pompeo and Kim Jong-un discussed the possibility of holding the second summit between DPRK and the USA, as well as measures Pyongyang and Washington needed to take for denuclearization to proceed. To have a more detailed discussion about the denuclearization process and the preparations for the second North Korea—United States summit, plans are in place to create working groups. From an official viewpoint, the key outcome of this summit was Kim’s invitation, extended to American inspectors, to visit the Punggye-ri Nuclear Test Site (note that the site was closed on 24 May in anticipation of the first North Korea—United States summit in Singapore) to confirm, in person, that it had actually been dismantled. Kim Jong-un also promised to shut down the nuclear facility in Yongbyon if reciprocal measures were to be taken by the United States. The author believes that in this manner, the two sides had broached the issue of fulfilling the North Korean condition, i.e. formally declaring the end to the Korean War. Hence, at the next summit, Donald Trump and Kim Jong-un could, if not sign this document, then at least express intentions to do so in order to continue on the path of establishing trust between the two sides. On 12 October, the U.S. National Security Advisor John Bolton said that the summit between DPRK and the United States might be held within the next two to three months. Earlier, in September, Trump had indicated that the meeting would take place after the congressional midterm elections, scheduled for 6 November, due to his busy work and campaign schedules. On 23 October, during an interview with the Russian radio station Echo of Moscow, Donald Trump also said that the meeting between US and DPRK leaders could take place at the beginning of the following year. During a press conference at the White House on 7 November, the US President announced that the second North Korea—United States summit will be held some time at the beginning of 2019. Having expressed his pleasure at the way the relationship between Washington and Pyongyang had been developing, Donald Trump noted that he was not in a hurry to have the next summit, since sanctions were working and missiles were not flying. Still, sanctions imposed on DPRK may be lifted on condition that North Korea take reciprocal steps, added the head of the White House. On the same day, on 7 November 2018, South Korean media sources reported that the meeting between the U.S. Secretary of State Mike Pompeo and the head of the United Front Work Department, Kim Yong-chol, which was meant to take place on 8 November in New York, had been postponed indefinitely. During their next meeting, Kim Yong-chol and Mike Pompeo are expected to discuss issues connected to establishing verifiable means of confirming the dismantlement of the Punggye-ri Nuclear Test Site, and the closing of the Tonghae Satellite Launching Ground. The topic of inspecting the Yongbyon Nuclear Scientific Research Center may be broached too. The US Department of State insisted that the main reason for postponing the meeting was the incompatibility of the participants’ work schedules. However, the US Ambassador to the UN, Nikki Haley, said the real reason was the lack of preparation for the meeting on the DPRK side. According to South Korean experts, the two sides had most likely been unable to agree on the agenda for the meeting, which was cancelled only a day before it had been scheduled to take place. It is also possible that North Korea viewed the upcoming negotiations as lacking in purpose, because Pyongyang continues to insist that sanctions be lifted, while Washington has no intention of doing so until it is sure of complete, irreversible and verifiable denuclearization of DPRK. 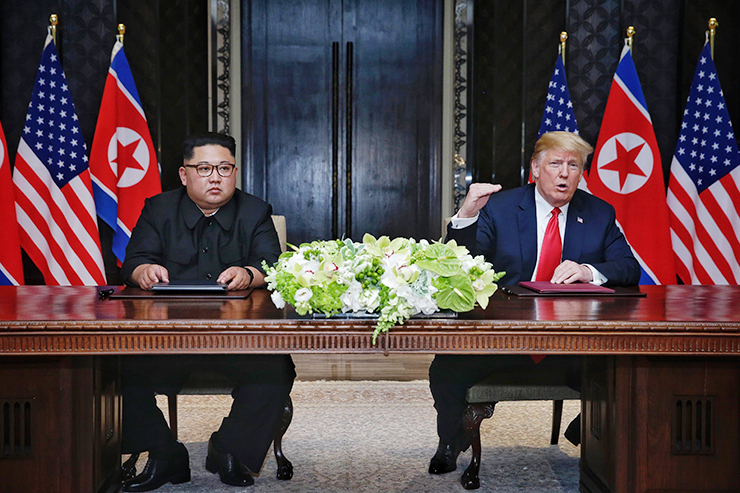 According to the Associated Press, Donald Trump commented on rescheduling of the negotiations by saying that he would like to lift the sanctions, but DPRK had to take reciprocal steps forward. He added that every stick had two ends, but Americans were not in a particular hurry, and there was no need to rush. In the interview with the TV channel NBC on 16 November, the Vice President of the United States, Mike Pence, said that the second meeting between the US President and the DPRK leader would be dedicated to developing a plan for denuclearization of the Korean Peninsula, and include Pyongyang sharing a list of all of its nuclear sites and weapons. Pence emphasized that incredible progress had been made in normalizing the situation in DPRK, still the pressure on Pyongyang via sanctions would continue until complete, supervised and irreversible denuclearization of DPRK. On 21 November, during a telephone conversation with the Kansas radio station KQAM, the U.S. Secretary of State Mike Pompeo again expressed hope that the second summit between DPRK and the United States would be held at the beginning of the following year, having noted that there was still much work to be done in the process of denuclearizing North Korea. According to him, the dialogue with DPRK is ongoing, but it may take longer than expected, because the issues involved are so complex. Still, the goal of the US Department of State is crystal clear: to implement the agreements reached by the US and DPRK leadership. In reality, the earliest the summit could be held is the end of January or the month of February in 2019. Preparations for such events take a minimum of two months, and it is important to remember that the US Christmas holidays are fairly long. In addition, on 1 January, Kim Jong-un will probably give his New Year speech that will include his detailed plans for the upcoming year. Such an address marked the beginning of the deescalation of tensions between North and South Koreas in 2018. Hence, the undertones of Kim’s speech and its themes will, in all likelihood, be used to adjust the date of the summit as well as its agenda. However, by and large, it is important to highlight that Donald Trump really has no reason to rush. When he said that the situation was developing favorably from the US perspective, the sanctions were working and missiles were not flying, he was absolutely right. Still, there is pressure for the agreements, reached at the first summit, to lead to another breakthrough in the dialogue, which, in reality, Washington is not ready for. North Korea could take some concrete steps forward, but Kim Jong-un promised to do so only in return for concessions from the USA, including easing of sanctions, imposed against DPRK, and declaring the end to the Korean War. Although the results of the midterm elections protect Donald Trump from imminent impeachment, significant concessions (or what his opponents would view as concessions) from the USA would damage his standing and reputation.